Today’s world is mobile. Your clients and staff members spend more time looking at their smartphones than anything else. Smartphones make nearly everything quicker and easier - especially communication. The question is - how do you make sure the communication from their pet care company is just as easy to receive and respond to? The answer is Text Messaging! Time To Pet provides support for sending and receiving text and picture messages to both your clients and your staff members directly from our platform. Text Messaging is deeply integrated into the core functionality of Time To Pet. This creates a seamless way to deliver text messages to your clients and staff without changing how your business operates. Sending a text message from Time To Pet is super easy and uses the exact same process as sending any type of message. 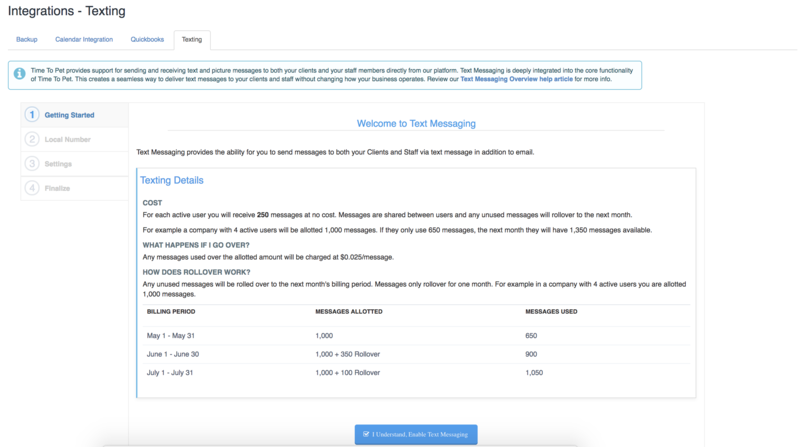 All messages sent as texts are stored right in your client or staff’s conversation feed in chronological order as well. Your staff and clients can respond to the text from their phone and it is immediately stored in their conversation feed too! You can also set the default message delivery type for each client/staff or pick and choose what type of message you would like sent right from the client or staff member's profile page. That means if John Doe wants texts, Suzy Smith wants a text and an email, and Bob Bones wants just an email - you can accommodate them all! Texting gives you a real-time way to communicate with your clients and staff that is quicker and more personal than email but still automated and integrated into your Time To Pet system. To enable Text Messaging, go to your Advanced Settings and select "Texting" from the menu. One of the first steps with setting up Text Messages is to select your “text message only” phone number. This is a local number that you choose for your company. All texts sent from you business will be sent from this phone number. Your clients and staff can respond and send text messages to this number, and their messages will be automatically sorted to the appropriate conversation feeds. How do text messages in Time To Pet work? That is a great question! As we mentioned, Texting is deeply integrated into the Time To Pet system. Text messaging in Time To Pet does not work like a standard text where you have to take your phone, open your messaging app, find a contact and send the text. Because texting is fully integrated into Time To Pet, it’s actually much easier than that! Think of texting in Time To Pet as sending an email but the email is actually delivered as a text message. In TTP, all texts are automatically generated by our system and delivered to your clients or staff based on their pre-selected phone number field (like the “Primary Phone” field). Sending a text in TTP is as simple as configuring your default settings and then sending a message just like you always have! Messages sent from your staff members via the mobile app will be delivered using the default settings for that particular client, and messages sent from the TTP website can be sent as text, text & email, or email only. Your staff and clients can respond directly to the text, and TTP will match the message with the number that has sent the text. If you don’t have a matching number in your system, you can manually assign that message to a customer or staff member. Time To Pet will always notify you of new messages as well! Yes they are! You can send both text and picture messages using the Time To Pet Texting feature. Text messaging is included with Time To Pet! This includes 250 text messages per each active staff member. Texts can be shared by all staff so a company with 2 staff members has 500 texts per month. If one staff sends or receives 300 texts, and one sends or receives 100, there are no overages. Texts will actually rollover to the next month, and any overages are billed at the end of each month at a rate of $0.025/text.